This division is referred to as an etiological classification, as the presenting disorders are classified according to the cause (etiology) of the condition. Under some classification systems, the last two groupings (psychogenic and functional) are combined under the heading ‘behavioral’. Hence, two major groups are identified: organic and behavioral. However, for the purposes of this article, we will maintain the division into three groups and begin by considering organic disorders. If the mass of the vocal folds (vocal cords) is increased then the habitual pitch of the voice will be too low. This could occur briefly, for example, as a result of a heavy cold in which there is an excessive build up of mucous on the vocal folds. Growths on the vocal folds, such as vocal nodules or polyps, will lead to the pitch being too low over an extended period of time. In contrast, if the vocal folds are held under too much tension then the pitch will likely be too high. Similarly, variable tension in the vocal folds will lead to the pitch being unstable and possibly lead to pitch breaks, i.e. the pitch suddenly shooting high above or below the habitual pitch. Forcing air from the lungs through the larynx with excessive pressure can lead to the voice sounding too loud. This is exacerbated if the vocal folds are also held with excessive tension. In contrast, insufficient air pressure passing up through the larynx, together with weak vocal fold tension, creates a voice that is too quiet. As with pitch, variable vocal fold tension and/or variable air pressure can lead to breaks in loudness. Structural and functional impairments that affect the hard or soft palate typically create hypernasality. The voice is said to be hypernasal because too much air escapes through the nose when speaking: there is excessive nasality. In some instances, the escaping air creates an audible sound known as nasal escape or nasal emission. A cleft palate or neurological weakness affecting the movements of the soft palate are two conditions that may result in hypernasal resonance. Any condition which obstructs the airways above the larynx typically results in hyponasality. In contrast to hypernasality, the voice is hyponasal (i.e. lacking nasality) because insufficient air escapes through the noise when speaking. Most of us will have experienced hyponasality at some time – when we have had a heavy cold or flu which has resulted in a blocked nose. Other conditions such as growths in the nasal cavity (e.g. nasal polyps) and allergic rhinitis may result in hyponasal resonance. Any conditions which disrupt the regular vibration of the vocal folds will likely lead to changes in quality. The noise that we perceive in someone’s voice as a result of disorganized/chaotic vocal fold vibrations is known as hoarseness. Inadequate closure of the glottis (the space between the vocal folds) results in a breathy voice. [For an overview of laryngeal anatomy, see Larynx] Muscle weakness as a result of multiple sclerosis or Parkinsonism may result in breathiness. If the vocal folds are squeezed together with excessive force – hyperadduction – then the voice acquires a typically creaky or harsh quality. As well as neurological conditions such as cerebral palsy, general muscle tension and anxiety states can lead to harsh voice. In contrast to hyperadduction, if the vocal folds do not come together (adduct) at all then the voice is whispered. Paralysis of the recurrent laryngeal nerves of the larynx can lead to this condition, as can certain psychological conditions such as a conversion reaction (i.e. a condition characterized by bodily symptoms in the absence of any apparent organic cause but where there is evidence of psychological conflict). If the failure to fully adduct the vocal folds is intermittent, then the whispery voice comes and goes as some stretches of talk are voiced and others are voiceless. Flexibility refers to the ability to effortlessly vary paralinguistic features (particularly of pitch and loudness) to create an interesting and colorful voice capable of expressing a range of intellectual and emotional meanings. Consequently, conditions which limit variations in the pressure of the airflow through the larynx, the tension of the vocal folds, the strength of adduction and/or the lengthening and shortening of the vocal folds through rotational and sliding movements of the arytenoid cartilages (see Larynx) can lead to reduced flexibility. Complete absence of voice is referred to as aphonia, whereas the term dysphonia is usually reserved to describe a partial absence/partial disruption. We have seen how various impairments affect the acoustic features of the voice. These impairments can lead to various voice disorders. In what follows, you will see that the voice disorders are still described in terms of the underlying impairment(s). Strictly speaking, this does not actually describe the disorder as experienced by the person. For the person, a particular impairment will exhibit as, say, a disorder of pitch, a disorder of loudness, a disorder of resonance, and so on. Consequently, this method of classifying disorders is used by a number of authors. 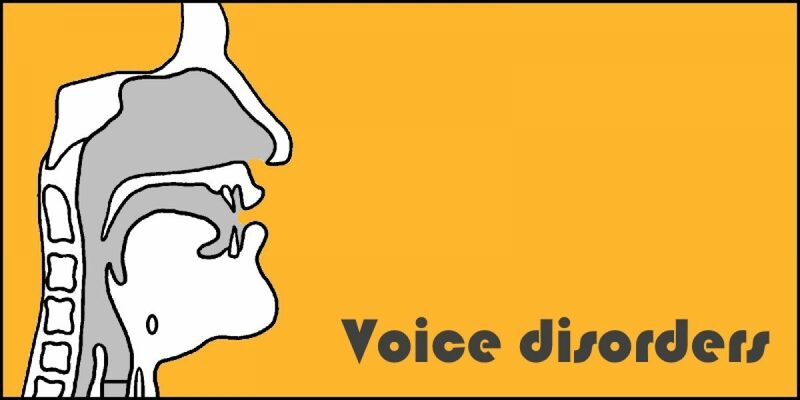 However, as this article is weighted towards flagging up the causes of voice difficulties, I will continue below to categorize voice disorders I relation to their etiology. Impairments of anatomical structure can be further subdivided into (1) congenital, and (2) acquired. These are conditions that are present at birth regardless of their cause. They may or may not be hereditary. An example of a congenital structural abnormality is cleft palate, which we have already noted above can lead to hypernasality. These are conditions which are not congenital but which develop after birth. An obvious example is a trauma, such as a road traffic accident which results in injuries to the vocal tract. The natural aging process may also lead to presbylarynx. This is the loss of vocal fold elasticity due to aging. Typically the pitch range is restricted, loudness is reduced and the voice quality may be either hoarse and/or breathy. Neurological impairments may similarly be congenital or acquired. Some examples are: Parkinsonism, motor neuron disease, pseudobulbar palsy, and stroke. The range and severity of symptoms varies markedly but, again, it is the paralinguistic features that are affected, albeit to varying degrees. Here the cause of disruption to the acoustic features of the voice are physiological in nature. For example, lesions of the endocrine system (i.e. the glands that secrete the hormones which regulate certain bodily functions) may lead to voice difficulties. The best-known example of this is thyroid disease (thyrotoxicosis). With hyperthyroidism, there can be reduced loudness of voice and a lowered pitch. Inflammatory conditions such as laryngitis, gastric reflux and allergic reactions can all lead to voice changes. As mentioned, anxiety states and conversion reactions can all result in voice changes. A condition that can affect adolescent boys is puberphonia. Typically the boy has developed secondary sexual characteristics but he retains the high pitched voice he had prior to puberty. There are many suggested explanations for this but it is thought that there is a strong psychogenic element. For example, fear of taking on adult responsibilities; rejection of a masculine voice in favour of a more feminine presentation. We have noted that a functional voice difficulty is the name given to a type of voice difficulty in which the voice quality is poor in the absence of any obvious anatomical, neurological, or other organic difficulties affecting the larynx. It generally affects women more than men and is probably one of the most common voice difficulties. The voice is typically hoarse, husky or rough. The pitch may be too low and the pitch range is often restricted. The breathing may be uncoordinated. Voice disorders in this category are sometimes referred to as muscle tension dysphonia (MTD). A good example of this is false vocal fold voice (technically known as plica ventricularis). The false vocal folds are not usually involved in the production of voice. They are formed from the same muscle that forms the true vocal folds but are positioned above these true folds. If they are pressed together during speech this obscures the true vocal folds. The resulting voice can sound harsh and breathy, with a lowered pitch. This forceful pushing is an example of a hyperfunctional voice disorder.